Understand and manage your DB2 environment like an ecosystem that is constantly changing in terms of physical design, transactions, and memory. Monitoring helps you maintain the balance at any given time to ensure the best possible performance. The NiCE DB2 smart Management Pack (DB2 sMP) gives you one integration point between Micro Focus Operations Bridge Manager (OBM) and your IBM DB2 servers. The integration with Micro Focus OBM is seamless. IT administrators can effortlessly keep a close eye on business-critical applications, infrastructures, and third-party service dependencies easily, ultimately ensuring minimal service disruption for the end user. The NiCE DB2 sMP ensures ‘always-on’ availability because this solution monitors your key operational activities and events. Information from important DB2 system tables is collected to reflect database activity. As such, you can perform service oriented management as well as incident management within the DB2 environment, thereby proficiently monitoring all the business critical processing. 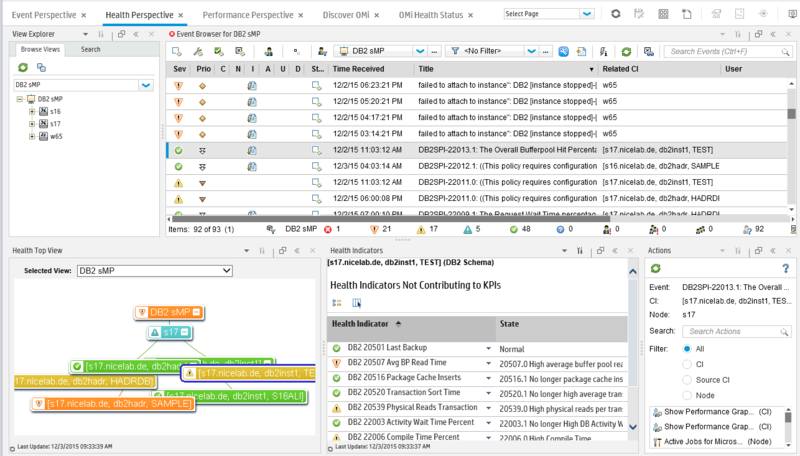 The NiCE DB2 sMP lets you efficiently manage and monitor your IBM DB2 environment in order to troubleshoot and identify problems with pinpoint accuracy. The NiCE DB2 sMP is the only solution of its kind on the market to monitor your DB2 database servers in an Micro Focus OBM environment. Monitor your DB2 database servers according to your actual business needs. The NiCE DB2 sMP allows you to effortlessly get an overview of all your DB2 instances and databases within the OBM Topology, including their status, with a simple click of your finger. 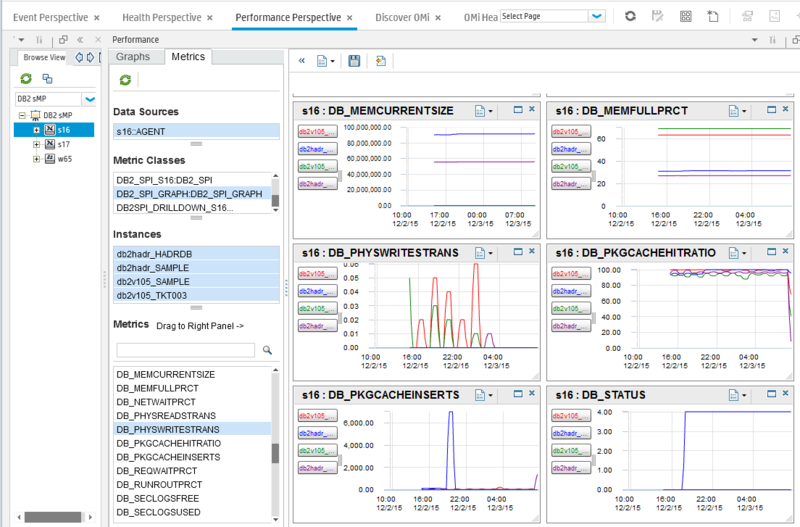 Set monitoring thresholds of selected performance data at instance and database specific levels to receive only really important alarms in the Micro Focus OBM Event Perspective. 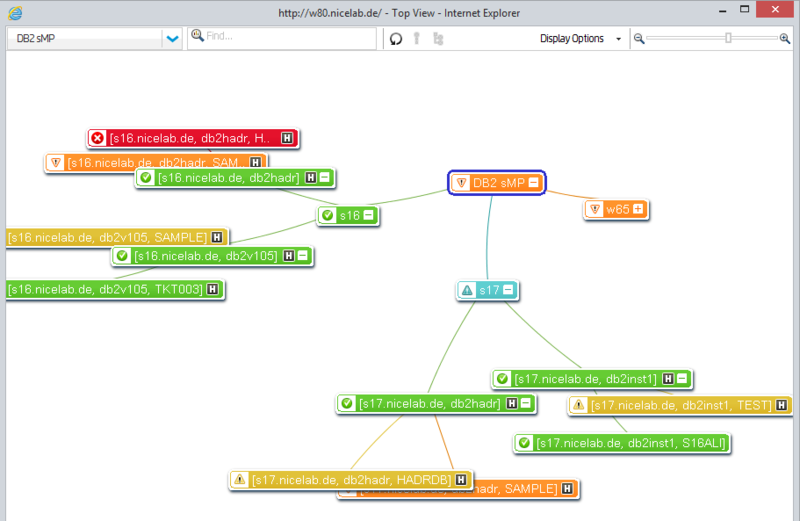 The NiCE DB2 sMP offers auto-discovery and diagram views of the IBM DB2 topology, the instances and databases, comprised of different Configuration Item Types and their interdependencies. This helps you to clearly understand the business impact of DB2 alerts so that you can align IT operations and services with business needs. The NiCE DB2 sMP helps you to increase performance and availability while lowering the overall cost of maintaining your DB2 databases. The NiCE DB2 sMP currently has no integrations into other solutions.